Detailed installation instructions at the end of the product description. 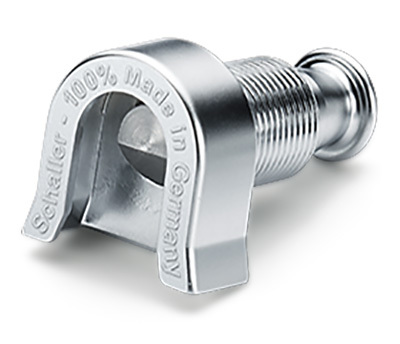 S for save, S for silent and S for Schaller strap locks! 3 pieces = 1 S-Lock - perfect! 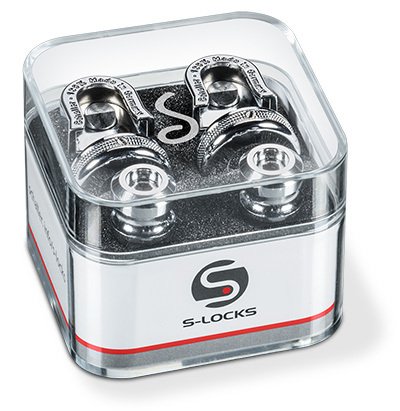 Our Schaller S-Locks come in a attractive re-usable crystal box that you can use as a storage container after removing the protective foam. Screw the strap buttons with attached felt washer into the existing holes by hand with a 3mm/1/8" Allen key. If there is still no drill hole, drill this depending on the wood used. 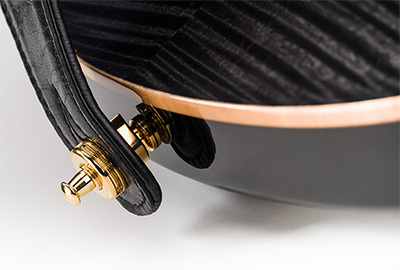 We recommend choosing the strap button first to match the size of the existing hole in the guitar. If the hole is too big or too small, please choose a different strap button or reduce / close / re-drill or extend the hole. 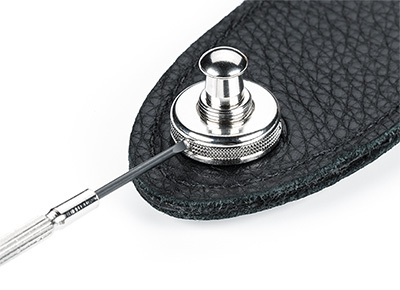 If necessary, countersink separately in the area of the outer lacquer layer to prevent the lacquer from flaking off when screwing in the strap button. Carefully screw in the strap button into the wood and, if it is too tight, unscrew it again and gradually drill up the drill hole. If the strap button is too easy to screw in, then reduce or close the hole and drill again appropriately. Tighten the strap button "hand-tight" to the instrument body. Do not continue by force. The wood may break, flake off the paint and tear off the strap button. Please check the secure fit of the strap button in the wood regularly and retighten the screw if necessary or reduce or close an enlarged hole as described and re-drill. Insert the lock through the hole in the strap. The lock is on the inside of your belt and the threaded hole for the lock-wheel on the outside. The open side of the lock (U-shape) points in each direction to the belt, so that the instrument can later safely hang in the lock. 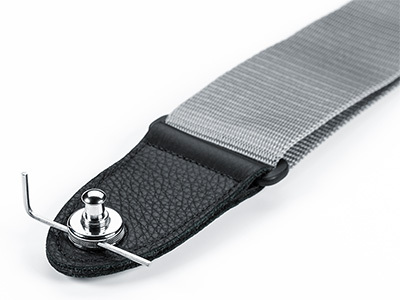 If the hole in the belt is too narrow or there is only one slot in the belt, please cut away a piece of the belt in a circle so that the thread can be easily pushed through the lock without the leather parts standing upright. Otherwise, the lock wheel can not be securely fastened and the lock and lock wheel can disengage. Turn the lock-wheel clockwise onto the thread of the lock. The flat side must point to the belt; the rounded side up! 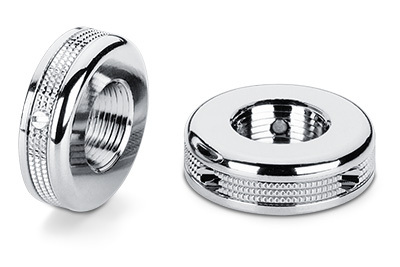 Make sure that the small set screw in the lock-wheel is not screwed inwards and destroys the thread. 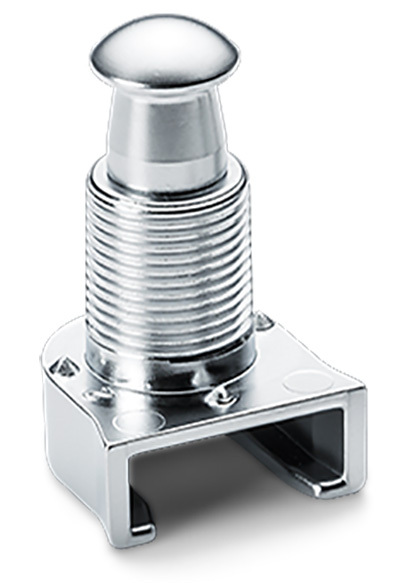 Use a 2mm/ 5/64’’ Allen key or small screwdriver through the 2-hole mount for an even tighter fit of the lock-wheel for maximum grip. Screw in the set screw with a cone tip and slot 2.5x5mm with a screwdriver until it stops. This will lock the thread and the lock wheel will not release. 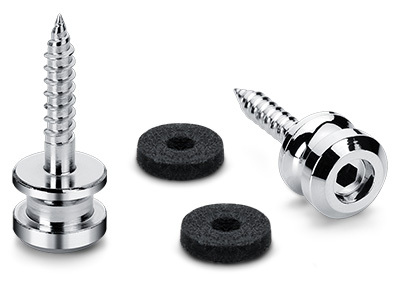 Check the secure seating of the set screw regularly and retighten the set screw if necessary. To unscrew the lock-wheel, simply loosen the set screw; the thread remains functional, it cuts through the lock-wheel again "free". 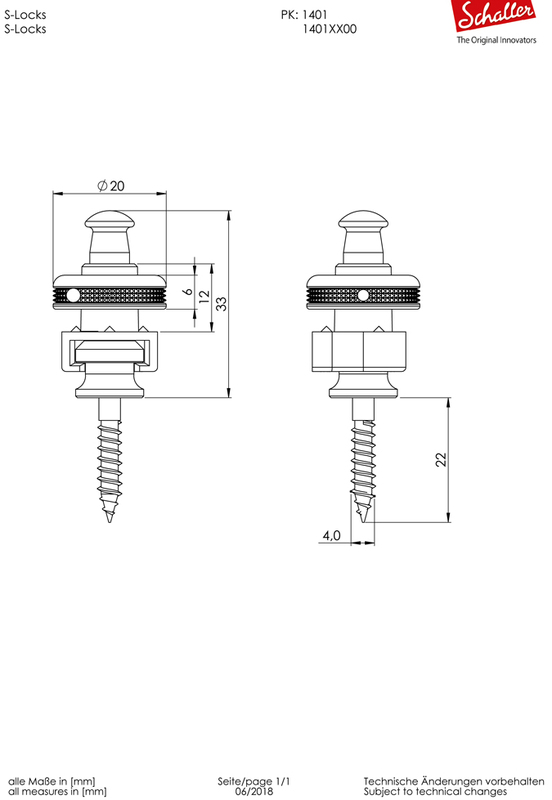 Before loosening or retightening the lock-wheel, always first unscrew the set screw so that it does not stand inward and the thread is damaged! 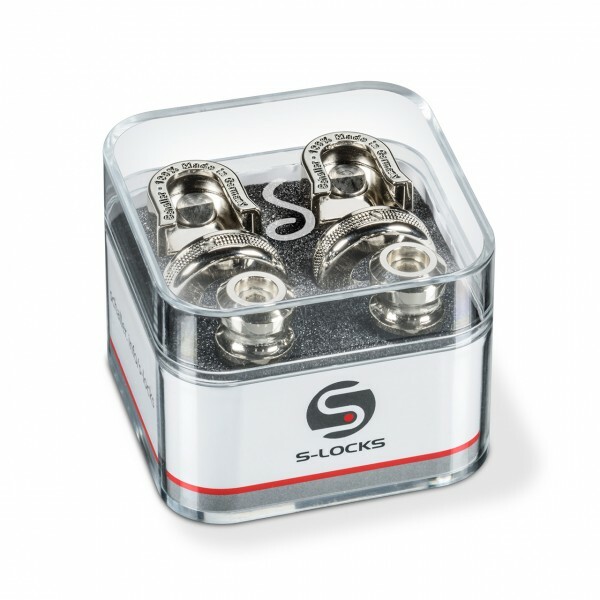 Pull the lock over the strap button without pulling the ball upwards until the lock clicks into place and the bolt lowers into the strap button. The instrument hangs in the U-shaped lock and is thereby held securely. Check the secure fit. To do this, try to pull the lock without pulling the ball from the strap button. The lock must remain engaged and must not be pulled down by the strap button. The ball must sit on top of the thread. To release the lock, pull the ball and pull the lock sideways away from the open side of the lock. Check all parts regularly for possible wear. Retighten all screws in a timely manner. 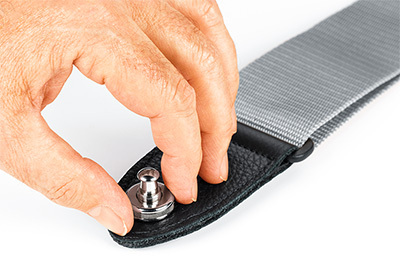 When playing, always check the secure fit of the lock on the belt, the locking of the lock in the strap button as well as the secure screw connection of the strap button in the instrument.